John Stuart Mason was succeeded at The Vine as Steward by Henry Parker. Henry Parker was the father of Prebendary Thomas Parker and some interesting snippets of information about life at The Vine in the second half of the 19th century are contained in the “Notes”. Henry Parker (see Plate 8) was apparently born on 1 January 1817 in Lincolnshire. He started as a farmer in Yorkshire but then moved into estate management for large landowners. 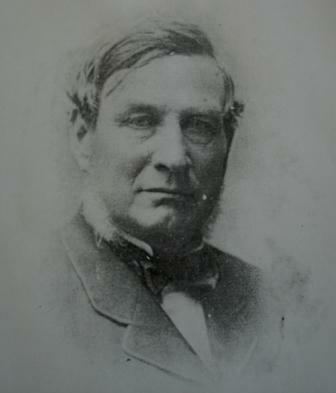 From 1852 till 1867 he was the Agent for Sir Tatton Sykes Bt. On 1 January 1868, his 51st birthday, he started as Steward for Lady Emily Foley and moved with his family into The Vine. At that time the family was already fairly large, consisting of Henry’s wife Elizabeth, his daughters Elizabeth Annie (born in 1858), Mary Ellen (born 1860) and Alice (born 1864), and sons Thomas (the later Prebendary, born in 1862) and a new baby, Richard Ernest, born just the previous year. It seems likely that they also brought with them from Yorkshire the children’s Governess, Clara Marshall. In 1869 the family received the addition of a further son, Herbert John, who was baptized in Tarrington Church on 21 September of that year. A few years after the 1871 Census, in 1874, a further daughter, Edith, was born to Henry and Elizabeth – bringing the family to the respectable total of four daughters and three sons. As they grew up, The Vine must have seemed quite crowded at times – especially as the Governess, Nurse, Cook and Housemaid all presumably lived in also. “Edward Fawke, known to us at the beginning as the young man from the Foley Arms, was gardener, groom, coachman and general factotum at the Vine from the 70s. He married Jane, our housemaid, and they lived at first in a thatched cottage up Church back lane; and had some very nice children, and a bush of “old man” in the garden”. “I can remember Mrs Hill from the Common coming to wash at The Vine in the old days, say in 1875. A gaunt woman, rather like Mrs Squeers, and vigorous. In her softer moods she was known to speak of her husband Thomas Hill, a painter, and mild. “H” she said, “Thomas Hill has been a good man to me. Never said a hard word scarcely, and never laid a hand on me. My word” she added (or do I imagine it), “I’d have given him something if he had””. The sons Thomas and Richard were presumably away at school by this time. Why the third daughter, Alice, does not appear in the return we do not know. If still living, she would have been 17 by this time – therefore perhaps married (if so, doubtless to the envy of her elder unmarried sisters!). It is interesting that the second daughter Mary Ellen is acting as Governess and “Secretary” (this latter a very modern term for the times) – presumably in the household. It is interesting also that the land attached to The Vine had shrunk to only 18 acres, compared with the fairly extensive lands so attached at the time of the 1838 Tithe Apportionment. One must assume that land had been re-allocated to Lays Farm, where the 1881 Census shows Samuel Cot [sic – in the 1891 Census the name is given as “Cox”] in occupation as “Farm Bailiff of 415 acres”. An 1885 map of the village (Map 4) shows the disposition of buildings round The Vine exactly as they presently are – including the present Vine Cottage and Heritage Cottage, which were then the Estate Office and Accounts. We know that the eldest daughter, Elizabeth Annie, had died in 1888 (at only 30). Poor Mary Ellen now looks as though she has been assigned the role of spinster housekeeper to her widower father. Young Herbert is perhaps preparing for the possibility that, as with the Edwards and Mason families before him, he may succeed to the Foley Agency after his father’s death. If so, it was not to be. Richard is presumably already in Queensland, Australia, where we know that he too died young, in 1893 aged just 26. Meanwhile, back to Thomas, Prebentary, Parker. We know that, presumably some time in the early 70s, he went to the Cathedral School in Hereford and was ordained in 1885. His childhood at The Vine, among the apple orchards and lush meadows of the Frome valley, clearly left him with a love of horticulture that lasted all his long life. After curacies and incumbencies outside the County, he came to Breinton as vicar in 1932 and remained there till his retirement in 1938 when he went to live at Vineyard Croft in Hereford. There he grew apples, of which he was apparently a connoisseur. He died in 1965 – at the age of 103 – at which time he was the oldest clergyman in Britain! Preb. Parker had married Caroline Masefield in 1929, the poet John Masefield’s sister. She herself was a noteworthy personality, having received violin lessons from Edward Elgar, when she lived in Tupsley and before Elgar’s rise to fame, and also having played in the orchestra whose performances of his own music were broadcast to the great man on his death bed. Henry Parker’s life was not quite as long as his eldest son’s, but of quite impressive duration nonetheless. He died at The Vine on 25 September 1900, aged 83. There is a tombstone for Henry, his wife, Elizabeth Annie and Richard Ernest in Tarrington Church graveyard.